MPECS Inc. Blog: SBS - Exchange Email Spam Issue with Question to You. 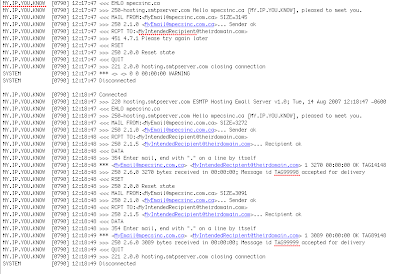 According to the SMTP RFCs 5.0.0 errors are permanant errors, 4.0.0 errors are temporary. 5.7.1 specifically is "Unable to Relay". for Greylisting a 4.0.0 code is used, usually 4.3.2 He is either blowing smoke or doesnt really know whats going on. BTW, Greylisting helps because most spam engines are written to completely ignore error codes from servers and just send the mail and move on to the next one. Along that same line, you can configure your SMTP (even exchange) to delay the response to EHLO by 20 seconds, and drop anything that starts sending data before it gets the response (Tarpitting). See http://support.microsoft.com/kb/842851 for how to configure tarpitting on exchange. I did do a cursory search for the information the tech fellow indicated and didn't find anything. So, this is exactly what I was hoping to hear! Tarpitting is definitely going on the ToDo list!